Consumer Packaged Goods (CPG) manufacturing is a leading global industry. Over the past ten years, food manufacturers have transformed business practices in response to changing consumer preferences. Campbell Soup, one of the largest CPG companies in the world, saw a decrease in profits of almost 20% in the last fiscal year, and is one of many Big Food companies that are experiencing the shift: since 2009, the top twenty-five food and beverage names in the United States lost the equivalent of $18B in market share to startups and small businesses. The entrepreneurs behind these smaller companies create products that reflect changing public values and build trust between company and consumer. Greater Boston has been an unsuspecting leader in CPG since the dawn of the NECCO wafer and cites companies like Schrafft's, Stacy's Pita Chips, and The Boston Beer Company as more recent success stories. Beyond brand, Boston is a place where innovative food product companies continue to launch and grow. The visionary ethos of Boston perfectly complements its historic roots. Kendall Square in Cambridge has been called the most innovative square mile on the planet, and much of Boston’s creative energy goes toward product development for CPG companies. With an experimental kitchen in Fenway, Chew Labs works with food companies both high and low profile to create tastier, more cost-effective CPGs. CEO Adam Melonas explains, “Everyone here has an equal seat at the table. It’s interesting to see the food scientists start to lean on the chefs to direct and guide the taste. And the chefs start to lean on the food scientists to help guide the conversation on stability, technique, and what’s possible, and where we go next.” The unique combination of food and technology found in Boston means the city incorporates both old-world tradition and new culinary innovation into its rapidly developing food scene. A profusion of commercial kitchens makes Greater Boston an ideal city for startup CPG companies looking to scale manufacturing out of home kitchens. CommonWealth Kitchen, with locations in Somerville and Medford, is one example of these shared community spaces, offering business assistance to aspiring entrepreneurs and strengthening the regional food economy. Smaller kitchens, such as Caroline Huffstetler’s Local Fare and Food Revolution, are able to provide allergen-free workspaces. Foundation Kitchen and Stock Pot Malden offer even more variety to the mix. Many CPG startups, whether they need storage, guidance, or workspace, use these commercial kitchens as a steppingstone as they build their brand and their consumer base. One of Greater Boston’s most notable characteristics is its abundance of colleges and universities. Out of these institutions have grown community resources such as the Harvard University i-lab, where Harvard affiliates can participate in a twelve-week program that provides workshops and mentoring sessions about entrepreneurship. The founders of Six Foods, producer of one of the country’s first-ever cricket-based snack, started at the i-lab when they were undergrads before making a national debut. The startup BevSpot is another Boston education success story: founded by students from the Harvard Business School and MIT, the online tool helps bar and restaurant managers track inventory and spending. Annual events, such as Harvard's public lecture series on the science of cooking, further contribute to the conversation surrounding innovation and food. MIT's Sustainability Summit explores green technology, and the Harvard Food Better initiative hosts conferences which focus on the empowerment of food service employees. Harvard also hosts the Global Food+ Conference, which features top Boston area scholars in a wide variety of disciplines to highlight research findings related to food and its impact on society and the environment. At Tufts, the School of Nutrition Science and Policy combines the efforts of nutritionists, economists, policy makers, physicians, and many other experts toward the goal of improving nutritional health everywhere. With its Food Sol Program, Babson College focuses similar efforts on a different socio-economic sector through the Cultivate Small Business initiative, in collaboration with the Initiative for a Competitive Inner City (ICIC) and CommonWealth Kitchen. Through Cultivate Small Business, entrepreneurs from low-income backgrounds receive mentoring sessions, the chance to network, and small capital grants. Local funds including Beechwood Capital, Centerman Capital, and Sherbrooke Capital, to name a few, are providing capital for entrepreneurs to get their businesses off the ground and disrupt the food and beverage industry. The past five years have seen an increase in funds that invest exclusively in this industry, paving the way for transformative businesses, such as Boston-based Yasso and Spindrift, to realize their full potential. Financing reaches beyond local companies, too -- Fidelity and Bessemer Venture Partners invested in New York meal kit service company Blue Apron when it was in its early stages. Fresh Source Capital, which targets high-tech companies dedicated to sustainable regional economies, counts Just Add Cooking among its investments. Broadly considered the birthplace of the American Revolution, Boston offers CPG companies a legacy brand recognition unachievable anywhere else in the country. The craft brewery Samuel Adams exemplifies this position: founder and sixth generation brewer Jim Koch debuted his beer on Patriots’ Day in 1985, depicting the founding father mid-cheers in a pose now iconic across the nation. Beyond history, Boston’s reputation as an durable, revolutionary city is conducive to establishing legacy brands, and consumers respond with enthusiasm to enduring names -- the “What the Fluff” festival, held annually in Somerville, celebrates Marshmallow Fluff as a historic, even traditional food staple in New England, the nation, and abroad. Further to the west, Big Y Supermarkets have been one of the most recognizable grocery establishments in New England since 1936. Stacy’s Pita Chips got its start in Boston, and Quincy-born Dunkin Donuts (“Dunkin’,” “Dunks”) is another iconic brand, its comforting pink and orange logo glow never far from sight. Boston is a city of Millennials, with the highest concentration of 20- to 34-year olds of any populous American city. Values of that generation have already permeated the CPG industry. Sustainability, nutrition, and transparency in sourcing ingredients are three major movements that will continue to affect consumer preferences. Digital spending will also continue to increase, foreshadowed by the recent acquisition of Whole Foods by Amazon, the online retail giant reportedly soon to sign a lease for a space in Seaport. Investment in small businesses from big names in food ensures a virtuous cycle of innovation in the industry. In this spirit The Boston Beer Company, partnered with small business lender ACCION, provides financial advice and other business coaching to entrepreneurs through their Brewing the American Dream program. As digital spending continues to rise, a high number of niche markets will emerge, fueled by startups. Innovation in the CPG industry and support for small businesses are instrumental in Boston’s role as a national player. At Branchfood we aim to raise awareness about Boston as a leading food community. 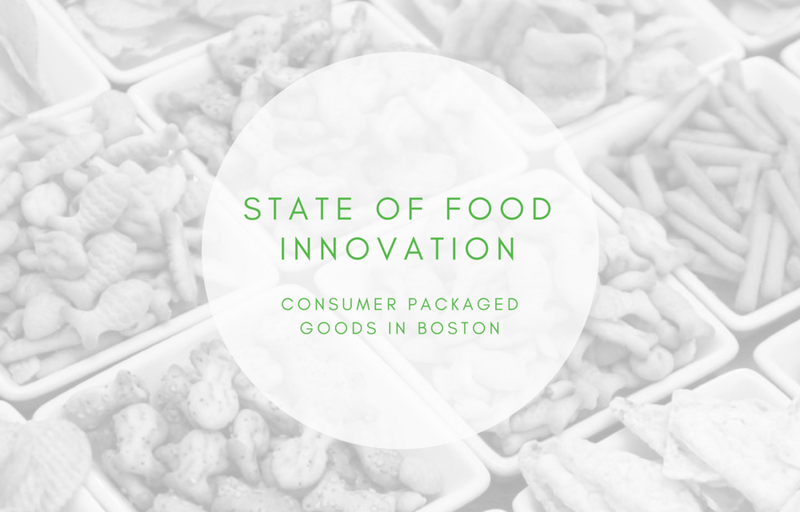 This blog post is the first in a series on innovation in Boston’s food and beverage industry. Written by Chloe Barran.